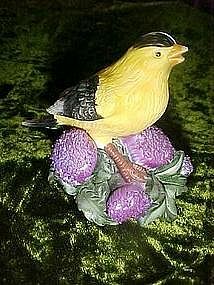 This nice little hand painted bird figurine measures 3 1/2" tall and is in great condition with no damages. Stamped on the bottom, American goldfinch. Made of a bisque porcelain and is hand painted.